Just a quick note to let you know how proud we are of Mayo and her tenacity in guarding the alpacas. 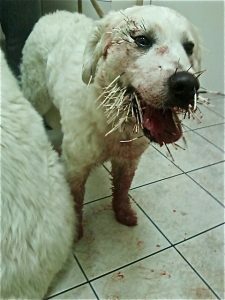 As you can see she had a serious run in with a porcupine 2 weeks ago and while she must have been in significant pain with the quills, she did not back off until she had finished her job and the porcupine. She did have to go for emergency surgery to remove the dozens of quills, but has recovered nicely and was immediately back on duty the next night, warning any other intruders to stay away. She has a great personality and the vet and technicians said she was a pleasure to deal with throughout her ordeal. I hope all is well with you. Next time you are driving by, please feel free to stop in for a visit. Jean and Aldo Marascio realized that Mayo should have some help, so more Kuvasz have been added to the mix. 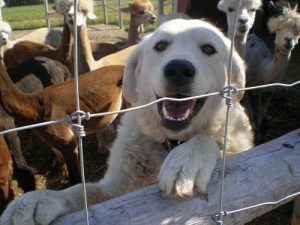 Kuvasz are excellent guardians and will fight to the death to protect their family and livestock. Depending on the size of property they are guarding, often more than one Kuvasz is required.